The basic technique for video astrophotography is as follows: Point your telescope at the object you wish to photograph. If you are using a motorized equatorial mount in a polar aligned configuration then subsequent tracking of the object (e.g., the moon) will be handled automatically. If your mount is not motorized, or if you are using an alt-azimuth mounted telescope like a SkyWatcher Dobsonian, then you will need to update the position of your telescope manually as the images are being recorded. This makes your task a bit tougher to accomplish, but it can most certainly be done. For simplicity, we’ll assume that you are using a motorized equatorial mount. Once you are pointed at your object, remove the eyepiece from the telescope focuser and replace it with your digital eyepiece. Now adjust focus and watch the monitor of your laptop or other video device that your camera is connected to. When you have achieved sharp focus, you can just watch and enjoy, or save the images on your computer. If you save your images you can later use any of a number of freeware programs to stack and process them. Or you can purchase more sophisticated program commercially for more functions and better results. A digital eyepiece along with your laptop computer and virtually any of our telescopes is a great combination at star parties. With this equipment many people can simultaneously view what the telescope is seeing. It is a great way to share your enjoyment of astronomy with others, but without risking your valuable eyepieces - which can take quite a beating at public outings! 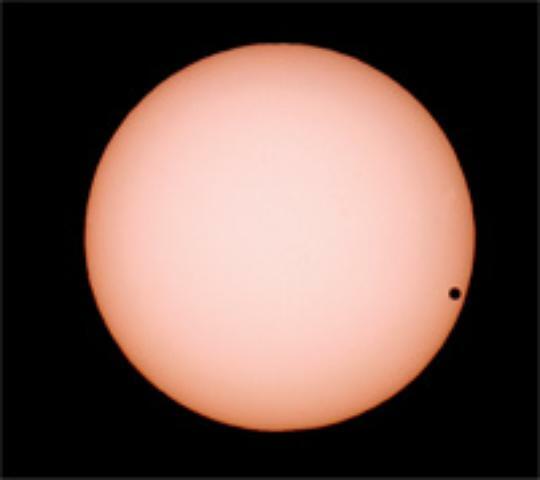 Venus Transit photo by Peter Roth, Canada. Taken with SK1025AZ3. Moon photos by Famille Dinant, Switzerland. Taken with 70mm refractor. Moon photo by Mengoli Giorgio, Italy. Taken with 80ED refractor. Harvest Moon photo by Bill Marsh, Canada. Taken with 100ED on EQ6 Pro mount.